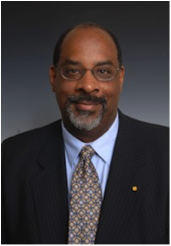 Today’s BEACON Researchers at Work blog post is by NC A&T faculty Dr. Joseph L. Graves Jr.
One nanometer is defined as 1 x 10-9 meter. This is about the size of one glucose molecule. The nucleus of a human cell is about 600 nm’s across and the average bacterium is about 1000 nm’s in size. Clearly many important biological phenomena occur at the nanoscale, including molecular self-assembly. The rate of the development of nanotechnology over the last twenty years has been astounding. Its applications are all around us. From sunscreens and dental adhesives, to the components of high technology devices. Nanotechnology is being proposed to build bioactive and biodegradable scaffolds for tissue engineering and for controlled drug delivery to treat chronic diseases. Reading these glowingly optimistic reports from those working with engineered nanoparticles (eNPs) was disconcerting. There were two major flaws in this thinking. First was the idea that bacteria would be widely susceptible to noble metals (copper, silver, gold, etc.). Second was even if this were currently true, that bacteria would not rapidly evolve resistance to them. It turns out that neither assumption is true. Bacteria have an array of resistance mechanisms to heavy metals in general and silver in particular (Silver and Phung 2006; Mijnendonckx et al. 2013). It turns out that essentially all bacteria have genes for toxic metal ion resistances. Amongst those best studied include those for Ag+, AsO2–, AsO4(3-), Cd2+ Co2+, CrO4(2-), Cu2+, Hg2+, Ni2+,Pb2+, TeO3(2-), Tl+ and Zn2+. The largest group of resistance systems functions by energy-dependent efflux of toxic ions. Fewer involve enzymatic transformations (oxidation, reduction, methylation, and demethylation) or metal-binding proteins (for example, metallothionein SmtA, chaperone CopZ and periplasmic silver binding protein SilE). Some of the efflux resistance systems are ATPases and others are chemiosmotic ion/proton exchangers (Silver and Phung 2006). To test the second assumption, I decided to utilize a relatively “naïve” bacterium Escherichia coli K12MG1655 to determine how rapidly this strain could evolve increased silver nanoparticle resistance. This strain of E. coli did not have any of the sil (silver resistance) genetic elements in its genome. However, like most bacteria its genome normally contains heavy metal sensing genes such as the cus system. The Cus system aids in protection of cells from high concentrations of silver and copper. The histidine kinase CusS of the CusRS two-component system functions as a silver/copper responsive sensor kinase and is essential for the induction of the genes encoding the CusCFBA efflux pump. The efflux pump works by removing the toxic concentrations of the metal from the interior of the bacterial cell. 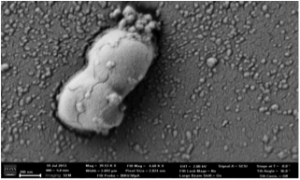 Scanning electron microscope picture of E. coli bacterium with AgNPs associated with cell wall (picture by M. Tajkarimi, JSNN). Our experiment was simple. We conducted an experimental evolution protocol using “off the shelf” E. coli K12 MG1655 and exposed it to increasing concentrations of 10nm citrate-coated spherical nanoparticles. We cultured the cells using Davis Minimal Broth with dextrose 10% as a sole carbon source, enriched with thiamine hydrochloride 0.1% in 10 ml of total culture volume maintained in 50 ml Erlenmeyer flasks. The flasks were placed in a shaking incubator at 37o C for 24 hours. This is generally considered a non-stressful growing media for E. coli. The cultures were propagated daily by transfers of 0.1 ml into 9.9 ml of DMB. The control populations were maintained in this medium without the addition of silver nanoparticles (AgNPs). The treatment populations were exposed to increasing concentrations of spherical 10nm citrate-coated AgNPs. Both the control and treatment groups were replicated five-fold. In this way we could determine if any of the mutations that arose in the control or treatment groups were shared by more than one of its populations. After determining the minimum inhibitory concentration (MIC) for this strain of E. coli, we exposed the treatment group to a concentration less than MIC so that some bacteria could survive. We wanted to allow enough survivorship such that a sufficient number of bacteria were left in the culture with potential silver-resistant mutations. In the non-exposed bacteria we would normally observe a 2-log increase in the culture over 24 hours (this is about 6.5 generations resulting in 106 founders growing to about 108 per ml of culture). At the beginning of the day the cultures would look “clear” but by the end of the day they would be “turbid” to the eye. Our goal was to observe the same sort of growth in the silver nanoparticle treated populations. This happened rapidly. Thus by generation 50 (~ 9 days later!) we were observing turbid cultures in the AgNP treated group exposed to 50 mg/L of 10nm AgNPs. After an additional 90 generations we were observing turbidity in 24 hours for the treated group at 100 mg/L of 10nm AgNPs and so on. 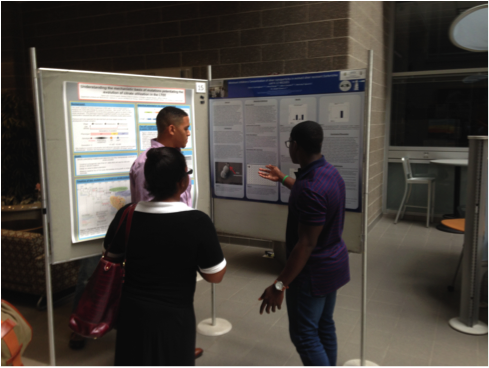 Undergraduates Quincy Cunningham and Herve Nonga explain MIC experiment results to Dr. Chandra Jack at Annual BEACON Congress, 2014. We tested the control and treatment groups at generation 250 for population growth over 24 hours in a range of concentrations of 10nm citrate-coated AgNPs, 10nm PVP-coated AgNPs, 40 nm citrate-coated AgNPs, 40 nm PVP-coated AgNPs, and bulk silver nitrate (AgNO3). Both controls and treatments were able to grow at 50 and 100 mg/L, but not surprisingly, the treatment populations showed superior growth compared to the controls at 250 mg/L, 500 mg/L, and 750 mg/L. In other words, the treatment group was now AgNP resistant, relative to the control bacteria. The experimental evolution protocol used in this study indirectly demonstrated that genomic changes must have occurred between the control and treatment bacteria. Next generation sequencing was used to investigate the genomic changes more directly. This process is facilitated by the fact that E. coli K12MG1655 has already been fully sequenced, allowing us to compare the genomic features of both our control and treatment populations against a reference genome for this bacterium. Thus we sequenced the “off-the-shelf” MG1655, our controls, and our treatments and compared their genomes to the reference using the breseq bioinformatic pipeline (developed by the Dr. Jeffrey Barrick, U. Texas – he is another BEACON scientist.) We sequenced the ancestral bacteria (off-the-shelf), generation 100 controls and treatment; generation 150 controls and treatment; and generation 200 controls and treatment via Illumina sequencing technology. Their sequences are then trimmed of Illumina adaptors, aligned to the reference genome, and genetic variants called against the reference genome. The E. coli genome contains ~4.7 million base pairs – so this is not an unsubstantial computational task. Going into the sequencing, I had expected to see a large number of genetic differences between the controls and the treatment populations. In fact, the results showed that not only did AgNP resistance evolve quickly, but that it didn’t take a great deal of genomic changes to achieve the result! The breseq pipeline allows one to investigate point mutations (SNPs), and deletions, insertions, insertion elements (indels). The genomic story was told mainly by three point mutations! As we are still finishing this study, I will not hang my hat on these results as of yet. However, stay tuned…the nature of science requires that we check our results. What we can say at this point is that it seems relatively easy for bacteria to evolve resistance to metallic nanoparticles (as they did to traditional antibiotics.) Care should be utilized before we intentionally and accidentally introduce these nanomaterials into our ecosystems. That is because evolution is always in action, even where you don’t suspect it. Gudipaty, S.A. and McEvoy, M.M., The histidine kinase CusS senses silver ions through direct binding by its sensor domain, Biochim Biophys Acta 1844(9): 1656-61, 2014 doi: 10.1016/j.bbapap.2014.06.001. Mijnendonckx, K., Leys, N., Mahillon, J., Silver, S., Van Houdt, R., Antimicrobial silver: uses, toxicity and potential for resistance, Biometals 26(4): 609-21, 2013. doi: 10.1007/s10534-013-9645-z. Rai, M.K., Deshmukh, S.D., Ingle, A.P., and Gade, A. K., Silver nanoparticles: the powerful nanoweapon against multidrug-resistant bacteria, J. Appl. Microbiol. 112(5): 841-52, 2012. doi: 10.1111/j.1365-2672.2012.05253.x. Silver, S. and Phung, le T. A bacterial view of the periodic table: genes and proteins for toxic inorganic ions, J. Ind. Microbiol. Biotechnol. 32(11-12): 587-605, 2005. This research project would not have been possible without the work of the following individuals; Mehrdad Tajkarimi, graduate student, Nanoscience Department, UNC Greensboro; Quincy Cunningham, undergraduate student, NCATSU; Herve Nonga, undergraduate student, Michigan State University; Adero Campbell, undergraduate student, Bennett College; and Dr. Scott Harrison, Biology Department, NCATSU. This entry was posted in BEACON Researchers at Work and tagged antibiotic resistance, BEACON Researchers at Work, E. coli, experimental evolution, nanomaterials, nanoparticles. Bookmark the permalink.